I'm so late I seriously cannot keep up with all of these shows! I'm going to try to do better but my reality t.v. calendar be poppin these days! Daniel "Boobie" Gibson is scheduled to see a doctor in Los Angeles and have surgery on his tendon that he injured during his basketball game. While his wife, Keyshia Cole, is there and trying to comfort Boobie, she gets a call from someone saying that her mother, Frankie Lons, is running around Oakland asking people for drugs. I thought Frankie was clean now? That's too bad. Get some help Frankie girl. 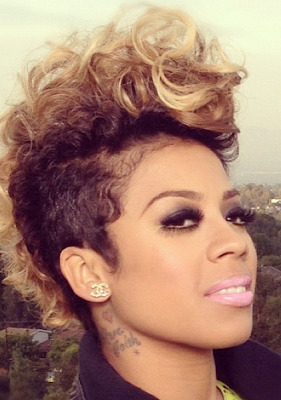 Keyshia ain't got time for Frankie and her madness because she's married now, y'all! And she isn't leaving Boobie's side for nothing. During the surgery, Keyshia's adoptive mother ,Yvonne, stops by the hospital and she brings Keyshia's adorable son Daniel Jr. with her. Yvonne is determined to find out what's going on with Frankie so she calls Frankie's sister and what do you know, Frankie is there and she is saying she will go to rehab in Los Angeles but she doesn't want to detox for two months because she has cats to take care of in Atlanta. Bad news for Boobie, he is going to miss the entire NBA season due to his injury. He soon forgets that his career is on hold when the doctors start to give him pain killers and he starts seeing "five Keyshias". Frankie flies from Oakland to Los Angeles to go to rehab. But before they drop her off at rehab facility, they have more important things to take care of like...getting their nails did! I'm mad that they didn't explain why Frankie's arm was in a sling though. What had happened, Frankie? Anyway, Frankie really wants to get sober so that she can be healthy and find her a good man. I wonder what happened to the young tender she was dating a couple of years ago? If you missed episode three, you know I got you! You can watch the episode here online. What did you think of episode 3 of Keyshia & Daniel: Family First? That's the problem there, Frankie needs to focus on getting sober and leave these knuckleheads ALONE! It irks me when women feel like they have to hunt for a man. Men are hunters by nature. Let that good man find you. In the meantime work on being the best woman you can be so when he does cross your path you'll be ready for him and he'll know a good woman when he sees you and will do all he can to keep you.